To experience the charm of the old, walled Cartagena, one simply needs to walk the streets, admiring the Colonial architecture while mixing with the locals, and maybe munching on some fresh fruit. I left the hostel around 9 AM, passing a bar I remember drinking at last year. The area was strangely familiar. My body was walking through the streets in the present, while my mind replayed scenes from February 2009. When I walked through the clock tower, which acts as an entrance to the old city, I immediately saw Tu Candela, another bar I’d been to before. More flashbacks, however this time I was traveling on my own, with no pressing deadlines to worry about. 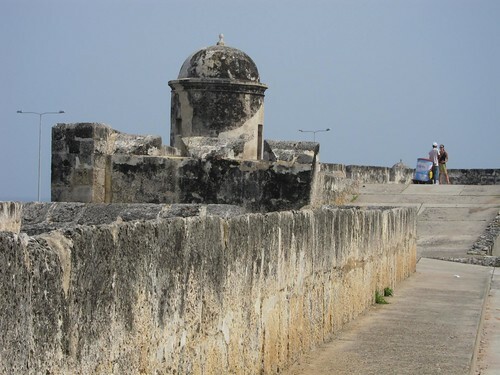 Walking along Las Murallas (the walls) that suround and protect Cartagena's historic center. I made my way to Las Murallas, the thick stone walls dating back to the 16th century, that encircle the old city. Rusty canons face the sea, as though waiting for ghost ships from the past to lay siege today. It was 9:30 AM, and I was already sweltering under the sun, when I came upon a foreign girl talking to a lone Colombian guy selling drinks.